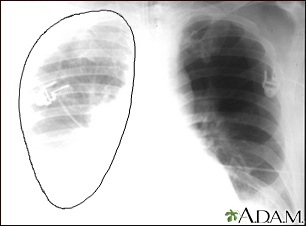 The aorta is the main blood vessel that supplies blood to the abdomen, pelvis, and legs. 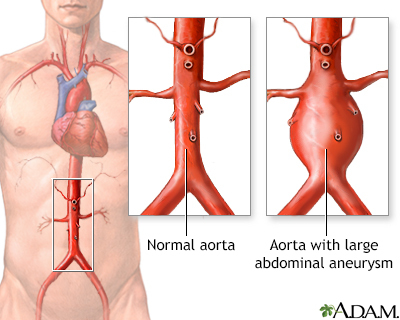 An abdominal aortic aneurysm occurs when an area of the aorta becomes very large or balloons out. An abdominal aortic aneurysm is most often seen in males over age 60 who have one or more risk factors. The larger the aneurysm, the more likely it is to break open or tear. This can be life threatening. Aneurysms can develop slowly over many years, often with no symptoms. Symptoms may come on quickly if the aneurysm expands rapidly, tears open or leaks blood within the wall of the vessel (aortic dissection). Pain in the abdomen or back. The pain may be severe, sudden, persistent, or constant. It may spread to the groin, buttocks, or legs. Any one of these tests may be done when you are having symptoms. You may have an abdominal aortic aneurysm that is not causing any symptoms. Your provider may order an ultrasound of the abdomen to screen for an aneurysm. Most men between the ages of 65 to 75, who have smoked during their life should have this test one time. Some men between the ages of 65 to 75, who have never smoked during their life may need this test one time. If you have bleeding inside your body from an aortic aneurysm, you will need surgery right away. You and your provider must decide if the risk of having surgery is smaller than the risk of bleeding if you do not have surgery. Your provider may want to check the size of the aneurysm with ultrasound tests every 6 months. Most of the time, surgery is done if the aneurysm is bigger than 2 inches (5 centimeters) across or growing quickly. The goal is to do surgery before complications develop. Open repair: A large cut is made in your abdomen. The abnormal vessel is replaced with a graft made of man-made material. Endovascular stent grafting: This procedure can be done without making a large cut in your abdomen, so you may recover more quickly. This may be a safer approach if you have certain other medical problems or are an older adult. Endovascular repair can sometimes be done for a leaking or bleeding aneurysm. The outcome is often good if you have surgery to repair the aneurysm before it ruptures. When an abdominal aortic aneurysm begins to tear or ruptures, it is a medical emergency. Only about 1 in 5 people survive a ruptured abdominal aneurysm. Go to the emergency room or call 911 if you have pain in your belly or back that is very bad or does not go away. Eat a heart-healthy diet, exercise, stop smoking (if you smoke), and reduce stress. If you have high blood pressure or diabetes, take your medicines as your provider has told you. People over age 65 who have ever smoked should have a screening ultrasound done once. Colwell CB, Fox CJ. Abdominal aortic aneurysm. In: Walls RM, Hockberger RS, Gausche-Hill M, eds. Rosen's Emergency Medicine: Concepts and Clinical Practice. 9th ed. Philadelphia, PA: Elsevier; 2018:chap 76. Fairman RM, Wang GJ. Abdominal aortic aneurysms; endovascular treatment. In: Cronenwett JL, Johnston KW, eds. Rutherford's Vascular Surgery. 8th ed. Philadelphia, PA: Elsevier Saunders; 2014:chap 132. LeFevre ML; U.S. Preventive Services Task Force. Screening for abdominal aortic aneurysm: U.S. Preventive Services Task Force recommendation statement. Ann Intern Med. 2014;161(4):281-290. PMID: 24957320 www.ncbi.nlm.nih.gov/pubmed/24957320.